Are Ukrainian agents really trying to destabilize Crimea from within? 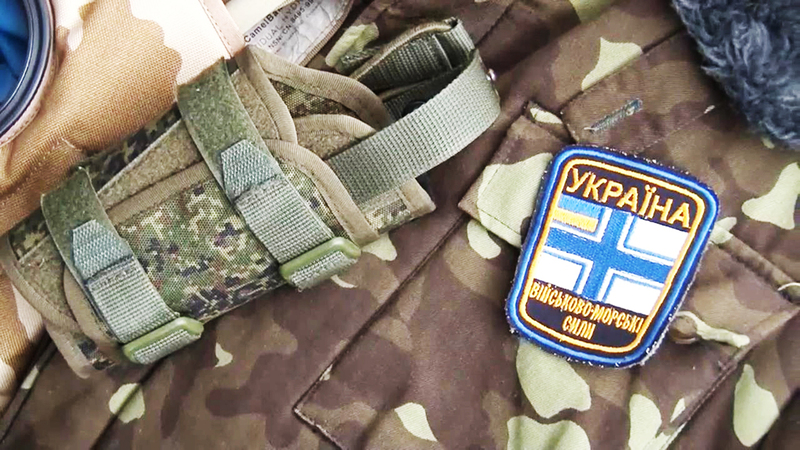 An arm patch of the Ukrainian Navy discovered in an apartment of Dmytro Shtyblikov, a member of the Ukrainian Defense Ministry's sabotage group. Shtyblikov was detained by Russian Federal Security Service (FSB) officers on suspicion of planning attacks on military sites in Crimea. The Russian Federal Security Service (FSB) says it has detained another group of Ukrainian “saboteurs” in Crimea. The Ukrainian side denies these reports. However, Russian observers claim that Ukraine is trying to destabilize the situation in Crimea and thus attract the West's attention to the peninsula. Russia’s Federal Security Service (FSB) says it has detained several Ukrainian saboteurs in Sevastopol. The detainees, according to the FSB’s announcement on Nov. 10, had planned acts of sabotage on military and civilian objects. This is not the first time the Russian authorities have claimed to have thwarted Ukrainian “saboteurs” – back in August the FSB arrested two people in Crimea, accusing them of plotting terrorist attacks. According to the Interfax news agency, this time three people were detained. An unnamed source at the agency said that all of them are employees of Ukraine's military reconnaissance service. They have already “admitted” their guilt and are testifying. ‘Sabotage’ in Crimea: What will be Moscow's next move? "After questioning the detainees the Crimean authorities determined that they had been preparing acts of sabotage on power stations, water treatment plants and Crimean gas distribution networks,” claimed the source. The FSB says that it has confiscated very powerful explosive devices from those arrested, as well as weapons and ammunition, special communication devices and maps and blueprints of facilities that were to be sabotaged. The Ukrainian Defense Ministry has declined to comment on the information, expressing perplexity in relation to the FSB's statements: "What kind of reconnaissance groups can be found in occupied Crimea?" The Ukrainian government does not recognize Russian rule in Crimea and sees the peninsula as occupied Ukrainian territory. Sabotage for the sake of spin? Russian experts interviewed by RBTH believe that the Ukrainian military is being deceitful and is refusing to accept responsibility for a failed special operation whose main aim was to create a certain PR effect. Sergei Goncharov, president of the International Association of Veterans from the Alpha Anti-terror Unit, says that the “sabotage” was supposed to show that the peninsula's population is fighting Russia. Russian observers underline that such operations are important, particularly at this moment, when it is clear that Donald Trump will be the next U.S. president. Earlier this year, in July, Trump stated that Crimeans themselves had preferred Russia to Ukraine. In Alexandrov's words, in such circumstances Ukraine would need arguments revealing that Crimea's residents do not want to be part of Russia. Consequently, these arguments are supposed to influence the position of the future American leader. This is not the first time the FSB has claimed to have exposed “saboteurs” from the neighboring part of Ukraine. On Aug. 10 the FSB reported that an agent network from Ukraine's military reconnaissance service had been uncovered in Crimea. On the night of Aug. 7 a group of saboteurs was allegedly discovered and detained not far from the Ukrainian border, resulting in the death of a Russian special service agent. On the following night, according to the FSB, a second group tried penetrating the peninsula, which led to the death of a Russian serviceman. The Russian special services said they had detained two saboteurs who “admitted” working for the Ukrainian military reconnaissance service. Vitaly Tsymbal, a specialist in the field of national security from the Russian Presidential Academy of National Economy and Public Administration, explains that the “saboteurs” failed to carry out their mission for a second time because of poor coordination on the part of the Ukrainian special services. Russian observers comment on the ineffectiveness of this alleged Ukrainian reconnaissance by claiming that Kiev has employed ideologized but relatively unprofessional servicemen who have fought in eastern Ukraine. One of those arrested in August, Yevgeny Panov, was described by the FSB as a combatant from a volunteer battalion, who had fought in the conflict against Russian-backed rebels in the Donbass. It is also possible that if genuine, these acts of sabotage were carried out by amateurs who have no relation to the official Ukrainian special services. Konstantin Bondarenko, a Ukrainian political analyst and head of the Ukrainian Policy Foundation, says there are many radicals and hotheads in Ukraine today who believe that their government has ceded Crimea and the Donbass and is in no hurry to recover them. "And these unprofessional operations are proof. They decided to take care of these issues by themselves. The other acts of sabotage this year also lacked agreement. That is why Ukraine as a state had such a sharp response – no one had sent them there officially," said Bondarenko, pointing to the fact that the story with August's “saboteurs” has been forgotten and no substantial proof of the incident has been presented by the FSB. Moreover, a business card supposedly belonging to Dmytro Yarosh, former leader of the Right Sector nationalist organization, was “found” on the spot where the latest “saboteurs” were detained. Right Sector is known for its conflicts with Ukraine's law-enforcement organs. This is not the first time Yarosh’s card has been “found” at the scene of a mysterious incident. Russian news site Lifenews reported (in Russian) in April 2014 that Yarosh’s card had been “discovered” in a burned-out vehicle belonging to anonymous attackers at a checkpoint manned by pro-Russian rebels in the eastern Ukrainian city of Slavyansk following a shootout. Analysts believe that Russia will not make any drastic moves in response to Ukraine's activity. "Moscow will take a pause and wait to see what the new U.S. administration's position will be on the Russian-Ukrainian issue," said Alexandrov.